From coyotes in the Bronx to red foxes in Queens, raccoons in Manhattan, owls in Brooklyn and deer in Staten Island, wildlife roams the urban jungle of New York. 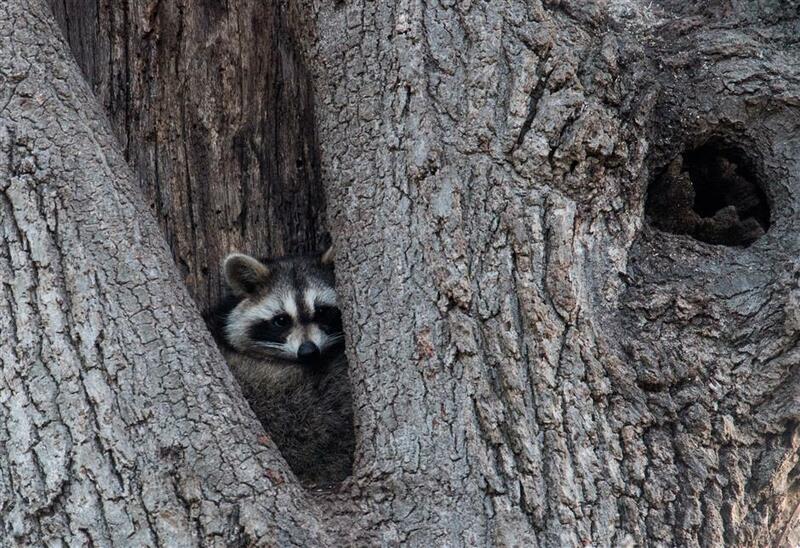 A raccoon rests in the hollow of a tree near Orchard Beach in New York. From coyotes in the Bronx to red foxes in Queens, raccoons in Manhattan, owls in Brooklyn and deer in Staten Island, wildlife roams the urban jungle of New York. But coexistence is not always easy between millions of wild animals and 8.5 million humans. But coexistence is not always easy between millions of wild animals and 8.5 million humans in a city better known for record-breaking skyscrapers, neon signs and a 24-7 pace of life than for its more than 600 species of wild animals. And if New Yorkers are animal- friendly, their love of wildlife can be challenged when a coyote gobbles up a house pet, a deer chows through tomato plants or a raccoon strews garbage across the street. Wildlife has been increasing for about 30 years in New York, with its 11,735 hectares of park, where hunting is prohibited and there are few natural predators, says Jason Munshi-South, assistant biology professor at Fordham University. He studied primates in Borneo and elephants in Gabon, but is now an expert on animal life in the US financial capital, North America’s most populous city. He estimates that thousands of raccoons live in New York — at least 100 of them in Central Park, together with several thousand deer and 50 nomadic coyotes, mostly in the Bronx, though they sometimes roam elsewhere. When it comes to marine life, seals have basked on the rocks of Pelham Bay in the Bronx, and the occasional whale has come up for air in the waters around Queens. 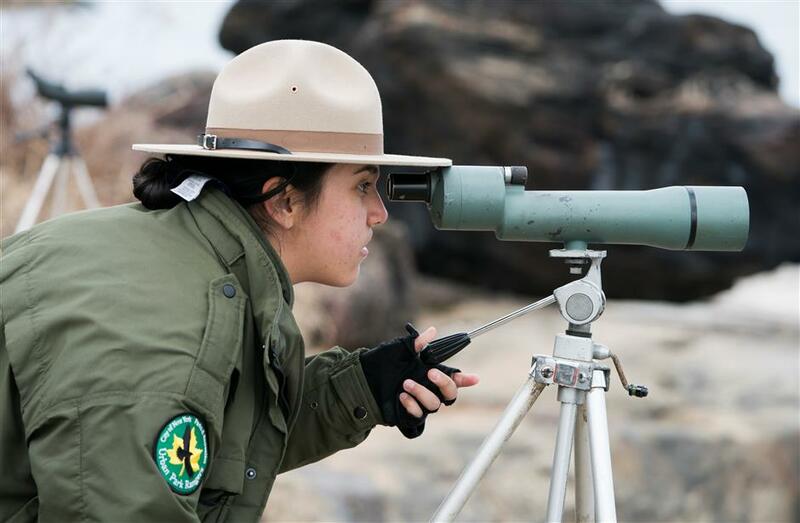 New York City Park Ranger Adriana Caminero views seals through a spotting scope near Orchard Beach in New York. Each spring, the piping plover — considered in New York and several other US states to be an endangered species — begins arriving to nest in Rockaway Beach. “Even if you haven’t seen a coyote, the coyote has seen you!” park ranger Kayla Mackey, 25, tells a group of residents at the workshop “living with urban coyotes” in a Bronx park on a recent, cold sunny Sunday. Mackey explains there is no reason to fear coyotes, which are difficult to spot because they move quietly at night. It is best to keep your distance and not feed them. If one approaches, she advises people to “act big.” After the briefing, the group embarks on a long walk in search of coyotes, or at least their tracks and droppings. “Coyotes don’t eat humans. People are not part of their daily diet,” Mackey, binoculars around her neck, tells the accompanying group of children and adults. “We have to give people tools to better coexist with wildlife. If you don’t know there are 2,000 deer in Staten Island and you drive fairly quickly you’re very likely to hit one of those deer,” explains Richard Simon, director of the city’s wildlife unit. 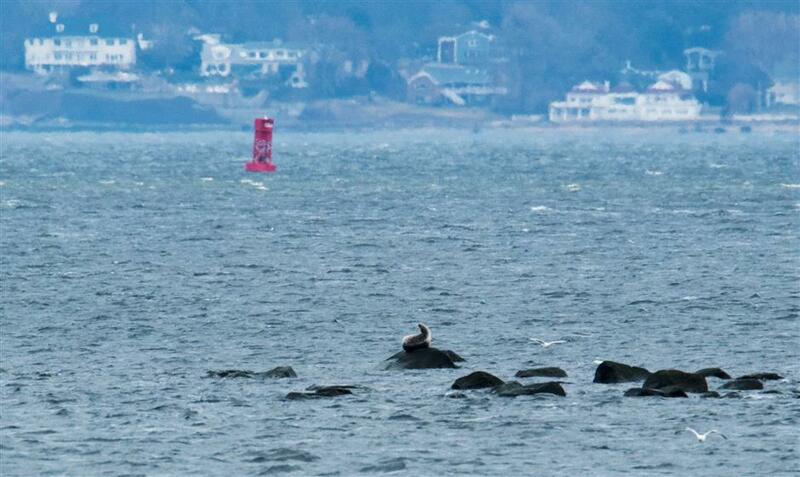 A Harbor Seal rests on the rocks near Orchard Beach in New York. New York set up the unit in late 2016 and has since implemented a program to sterilize about 95 percent of the male Staten Island deer population — about 1,100 animals, according to Simon’s estimate. “But there’s no place to take them to. They live here now,” he insists. If someone gets scared when they see a coyote and call 911, the police are obliged to respond. They will try to capture it. Some have been killed. A recent city campaign on mass transit featured photos of wild animals next to the strapline “New Yorker” and also urged people not to hand out food. “There’s no reason to feed a squirrel a hot dog or a pretzel,” says Simon. Feeding can mean that animals lose their fear of humans. It can also lead to biting. Some raccoons in Central Park can even become aggressive and try to steal food from passers-by. “Some people are surprised, they tell me ‘oh, I thought we only had rats here,’” says Munshi-South. “When we’re doing work in the parks in the summer and it’s very hot and there are a lot of mosquitoes it’s actually not that different from the way you feel” in Borneo, he joked.